January 8th 2014, or the 8th of December in Chinese solunar calendar this year, was the anniversary of Sakkyamuni’s Enlightment. With the Chinese New Year at corner, the perfect time to celebrate the discarding of the old and welcoming of the new, it is a most earnest wish of many to have a bowl of hot Laba porridge (literally, “porridge for the eighth day of the twelveth month”) from the kitchen of a Buddhist temple, to pray for a wonderful start of the new year. 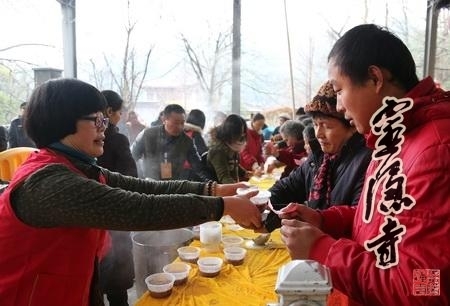 On this particular day, Lingyin temple dispensed Laba porridge to residents from all seven major districts of the Hangzhou city. 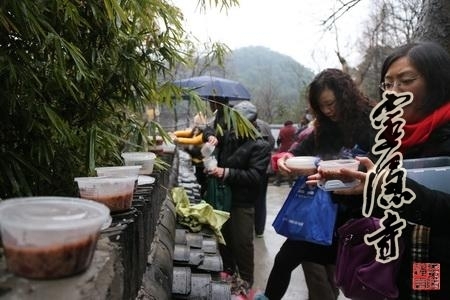 Together with what had been distributed in the previous days, Lingyin Temple distributed 300,000 portions of Laba porridge in total to citizens of Hangzhou, so as to share with the public the joy and blessing of Buddha’s enlightment. At six o’clock sharp, Lingyin Temple opened, and people who have been waiting in queues for long began to flood in. The crowd was guided by venerables and security guards to enter the distribution site through two points, where etiquettes were distributed to everyone by venerables and volunteers. As the people, separated into queues, arrived at the distribution points, they were welcomed by smiling volunteers who served each of them two bowls of steaming Laba porridge, which has been prepared prior to the event. Lingyin Abbot, Venerable Guangquan, was also present at the distribution site, smiling at and sending his wishes of good luck to everyone. Those who had received their porridge were overjoyed - some rushed home right after, so as to bring the warm Laba porridge from Lingyin temple back home to their loved ones; others tasted the porridge right on spot. Yet there were others who came in groups: they were enjoying the hot porridge and exchanging thoughts and feelings about it. Young fans of social network did not forget the pictures - photos of Laba porridge were taken and shared on social networks such as Weibo and Wechat, to tell families and friends the Buddhist fortune they were touched with. The safe and well-organised Laba porridge distribution this year should be accredited to the careful planning by Lingyin masters and volunteers. The credit goes to the effort from on-site police people and security staff, too. Also, this was a reflection of the positive ethos in Hangzhou, where the construction of a civil society has been promoted in recent years, and the behaviour of its citizen has been improving. According to Abbot Venerable Guangquan, it was the intention of Lingyin Temple to carry forward the Buddhistic and humanistic spirit of gratitude and appreciation, to inherit and spread traditional culture and practices, to promote ideas such as vegetarianism, the awareness of health and the protection of the environment, so as to facilitate the construction of a civil, harmonious Hangzhou.